Hello! My name is Kelly Hollings and I am lucky enough to be one of the project officers, working alongside Graham Holyoak and a super team of volunteers for a project called Restoring Ratty. We are based at Kielder Castle, if you have any questions about this blog, please call us on 01434 250898. 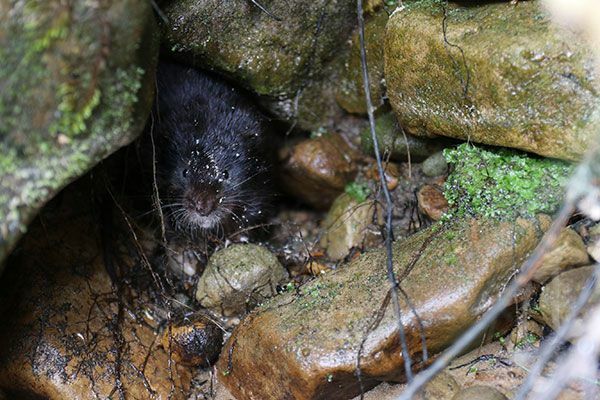 In the summer of 2016, ‘Restoring Ratty,’ was born; a five year partnership project aimed to re-introduce water voles back into Kielder, thanks to a grant of £421,000 from the Heritage Lottery Fund. Our partners are Northumberland Wildlife Trust, Forestry Commission and Tyne Rivers Trust. We are coming to the end of our first year; have learnt lots on the way, and have received so much support. Most importantly we have released 560 water voles back into Kielder on the upper catchment tributaries of the Kielder Burn and North Tyne above Kielder Reservoir. Our first task was to assist Ecologists from Derek Gow’s consultancy, Roisin Campbell-Palmer and Ben Wright to catch Water Voles from the North Pennines to breed from for our project. Consent was given to do this from Natural England and the North Pennines AONB. Only voles under 160 grams were taken as these were juveniles born in the very last litter and had a slim chance of surviving through the winter. We caught 16 voles in total from the North Pennines. Derek Gow already had some Water voles from a re-introduction project in Scotland taking the total up to 40 water voles to breed from. It is important to only breed from water voles in the North East and Scotland in order to maintain the correct genetic haplotypes. The Water voles spent the winter at Derek Gow’s consultancy in Devon and were paired up in March. The first young were born in late April. And in June 320 young water voles bred in captivity by Derek Gow were brought up to Kielder Water & Forest Park to be released! A huge thank you goes to all who helped us, especially our volunteers and staff from Forestry Commission and Tyne Rivers Trust. We undertook another release in August and will be repeating this for the next 2 years. 20 years ago water voles were common sights in Kielder, but were sadly wiped out by the American mink released from a local fur farm. Forestry Commission Rangers spent years trapping mink and we can now declare that Kielder is mink free and safe for the water vole’s return.